One morning this week I walked into the office to find silver boxes on every desk. 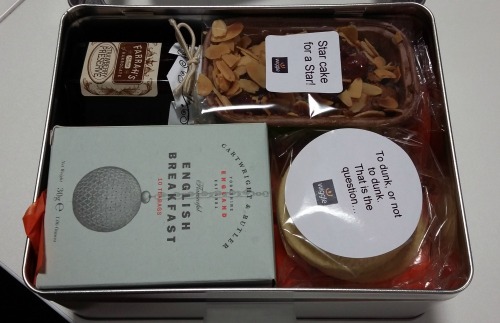 As a thank you for everyone's hard work over the year we had all been given a box containing a box of tea bags, strawberry conserve, biscuits and a little cake. All very nice, but it was the box which interested me. A nice silver metal box with a ‘glass’ panel in the lid so you can see the content, the lid was on hinges. After the content is gone the box can still have a job and I started to think what would be useful to me. It did not take me long to work out what to do with it. I made it into a UX box. 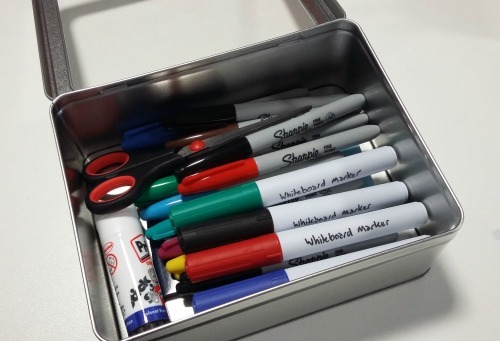 Something which I can take with me if running a workshop, filled with sharpies, whiteboard markers, blue tac, scissors, glue and post-it notes. All I would need in addition is some paper and I would be ready to create anything! Now all I need is a workshop to run. I do not think it will be too long coming.